From the Vatican in Italy to ancient mosques in Iran, the world’s most beautiful ceilings tend to be intricate masterpieces created centuries ago with the brushstrokes of a famous painter, dazzling ceramic tiles or panes of colored glass. But what about the ceilings of the modern world? 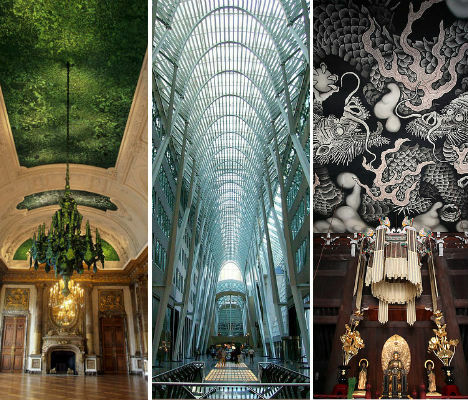 These 15 cool, crazy and amazing ceiling designs, all created within the 20th and 21st centuries, range from affordable solutions in small restaurants to stunning atria by world-class architects. It’s apparent at first glance that this is no ordinary ceiling; it’s vivid and iridescent in a way that suggests some kind of rare and special material. 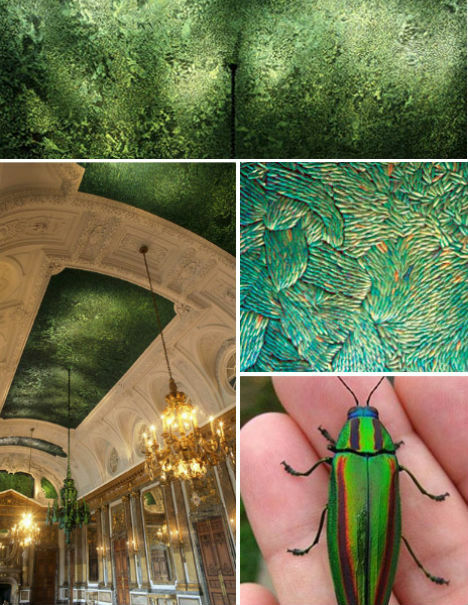 In fact, the ceiling – located in the Royal Palace in Brussels – is made up of an astonishing 1.6 million Thai jewel beetles. It took Flemish artist Jon Fabre and his team of 29 assistants four months to glue all the beetle shells in intricate patterns. 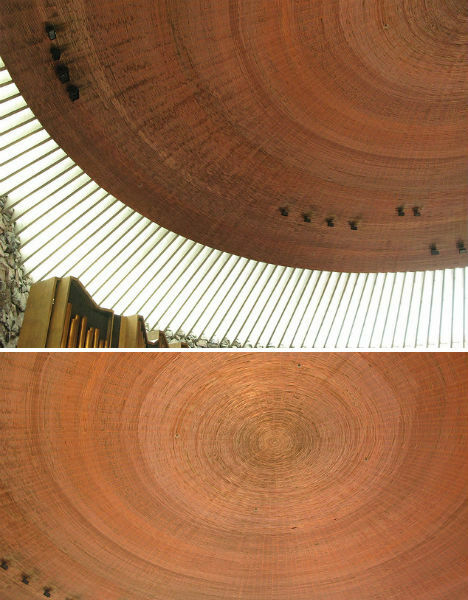 Built into solid rock in 1968-1969, Helsinki’s Temppeliaukio Church features an incredible domed ceiling made of copper wire, with a ring of glassed-in skylights that bathe the inside with natural light. Set into the ground, the rough rock church retains a rustic feel, but the domed ceiling has excellent acoustic properties, so the church is often used as a concert hall. 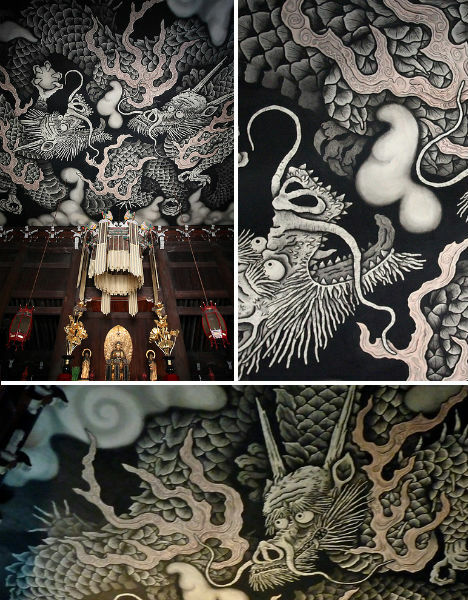 The historic Zen Buddhist temple of Kennin-ji in Kyoto was founded in 1202 CE, but its ceiling received dramatic modern paintings of two dragons in 2002 for its 800th anniversary. Artist Koizumi Junsaku gave the work a bold graphic quality, but the art is highly influenced by traditional Japanese aesthetics that are even older than the building. 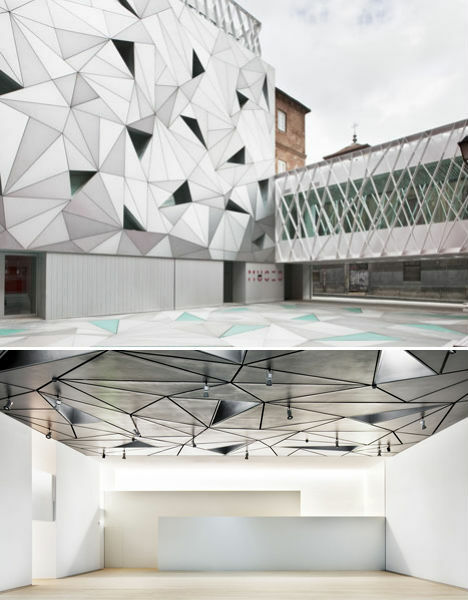 When Spanish arhitects Arranguren & Gallegos converted an old brewery into a museum, they continued the dynamic geometric pattern that characterizes the exterior onto the ceilings of the interior, complete with triangular skylights. 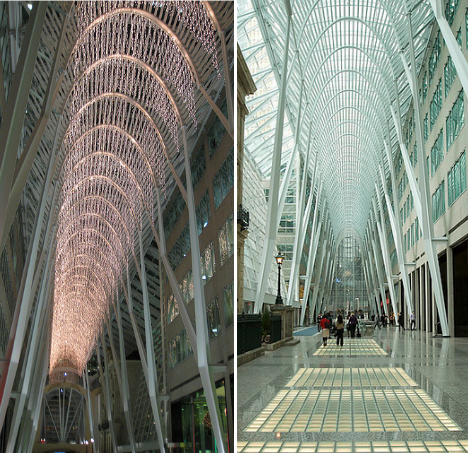 Located inside Brookfield Place, an office complex in downtown Toronto, the Allen Lambert Galleria is a dramatic atrium designed by famed Spanish architect Santiago Calatrava. The atrium, which connects Bay Street with Heritage Square, is six stories tall and supported by eight freestanding beams. At the very top of Dubai’s tallest building, the Burj Al Arab, diners can gaze up at this unusual ceiling in the Al Muntaha Restaurant, over 656 feet above sea level. 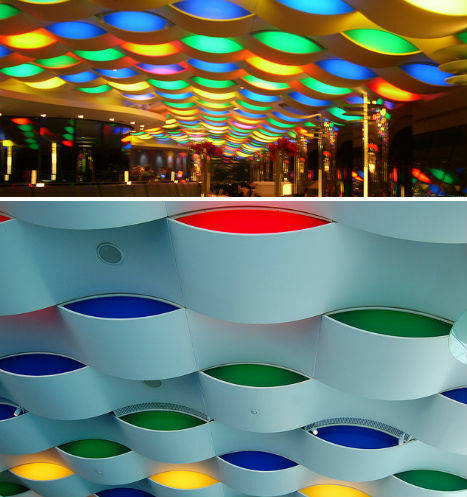 The wave-like ceiling is embedded with lights that change color throughout the day. 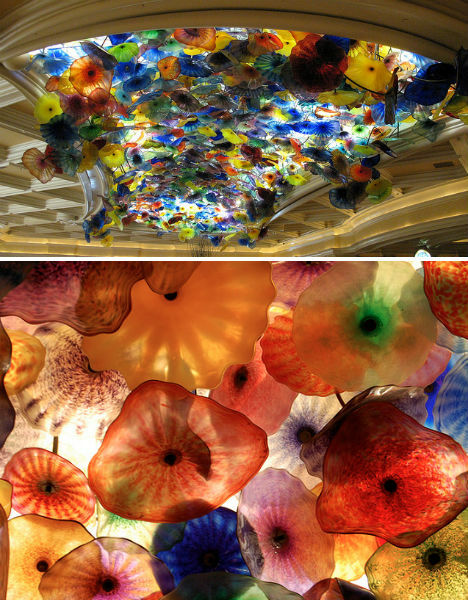 You could say that the custom blown-glass ceiling installation in the lobby of Vegas’ Bellagio Hotel is like a reverse Monet – from afar, it’s kind of a mess, but up close, the individual shapes of the glass reveal themselves to be quite lovely, reminiscent of sea life. This ceiling is the work of glass artist Dave Chihuly. 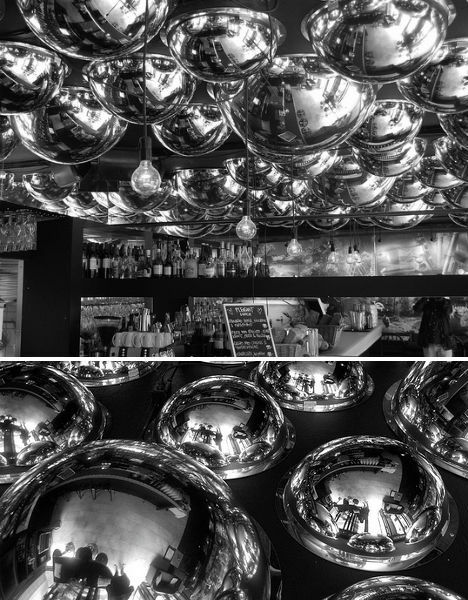 Though not overly complex or difficult to achieve, the mirror ball ceiling at Pleasant Bar in central Stockholm, Sweden creates a dramatic and memorable effect. Narrow strips of wood curve along the billowing surface of the ceiling at the Senedd, the main public building of the National Assembly in Cardiff, Wales. 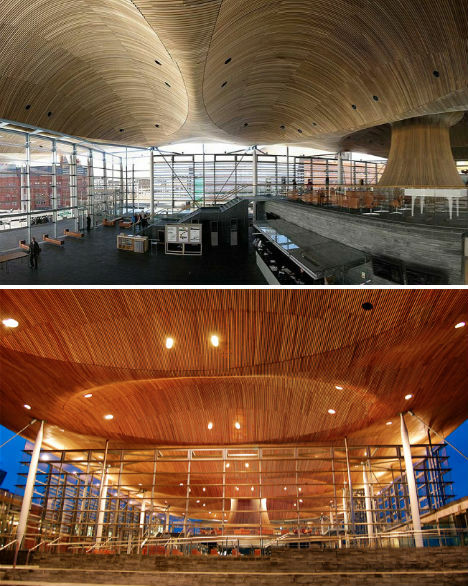 Designed by Richard Rogers, this very wave-like structure is made from locally-sourced Welsh oak. 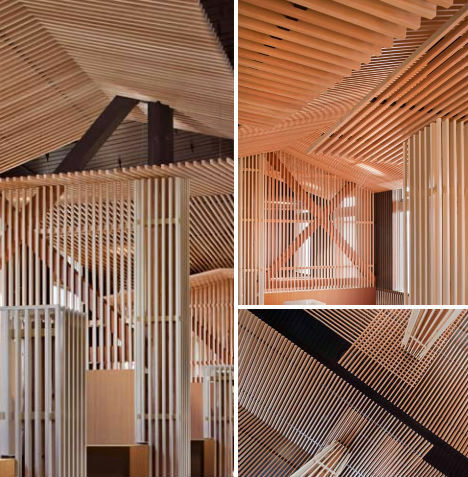 Thin wooden slats screen an ordinary ceiling at a ski resort cafe in Hokkaido, Japan. Design Spirits gave Niseko Lookout Cafe a modern makeover that nevertheless recalls traditional Japanese design. 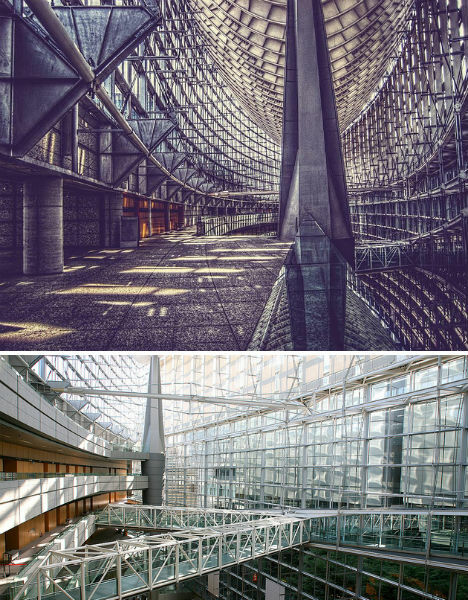 Home to one of the most spectacular modern ceilings in the world, the Tokyo International Forum is a multi-purpose center with event halls, exhibition space, restaurants and shops. Considered one of Japan’s most important examples of modern architecture, the ship-shaped building was designed by Rafael Viñoly. 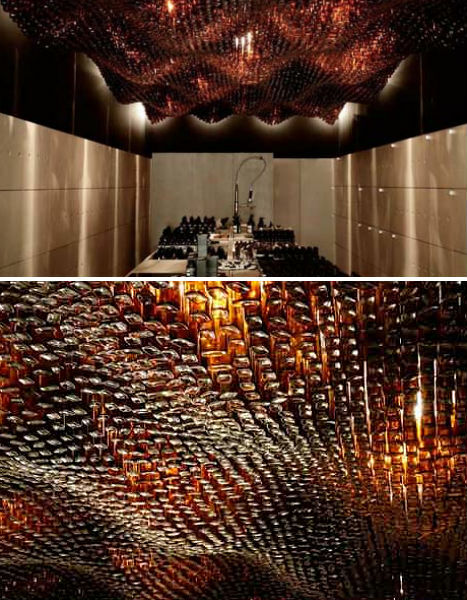 The undulating amber glass ceiling at this Adelaide location of Aesop, an Australian brand of botanical skin care, was achieved with an unexpected material – discarded glass bottles. 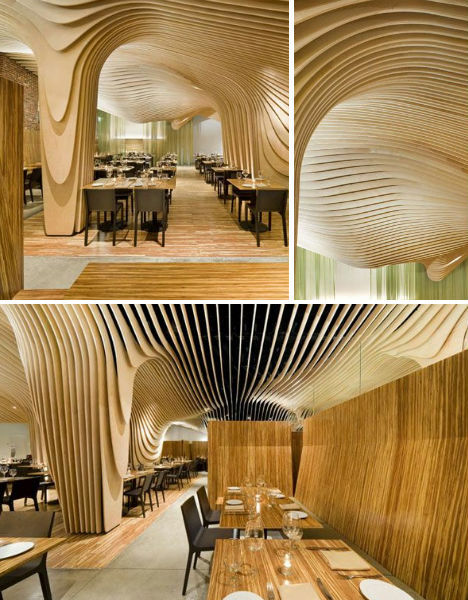 Located in Boston’s old Penny Savings Bank, a restaurant fittingly named Banq stuns with a wave-like ceiling application made of layered birch plywood. The design curves and flows around the restaurant, dripping down the support columns and some of the walls. This design was pre-cut off-site and assembled like a puzzle. 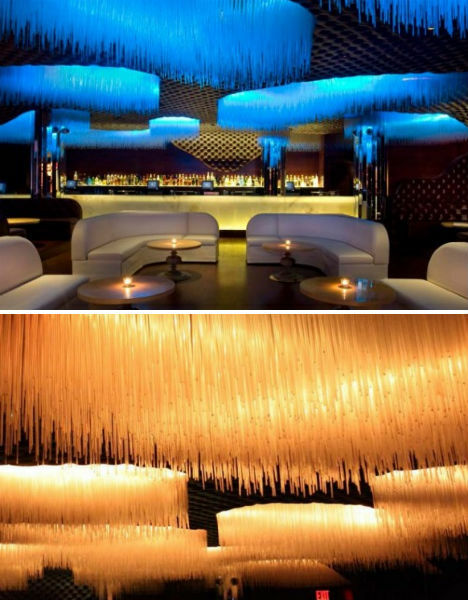 The Cienna Ultralounge in New York stands out for its eye-catching, drippy ceilings made of 88,888 strands of acrylic lit from within with LEDs. Not only do these unusual fixtures change color, they also move in time with music. Designer Antonio Di Oronzo of Bluarch Architecture & Interiors wanted the interiors of Cienna to resemble a silk cocoon. 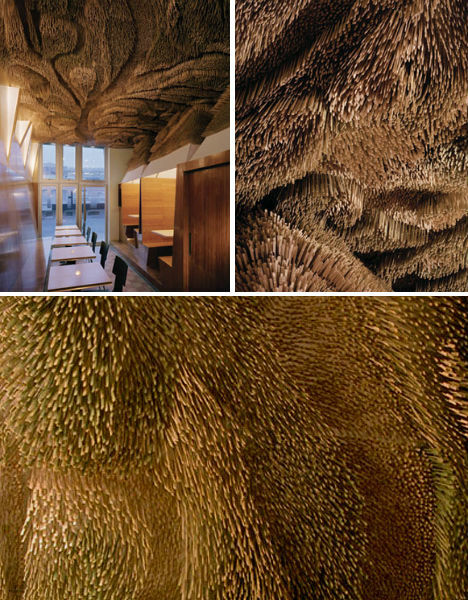 This ceiling at the Tides Restaurant in New York was achieved by embedding over 110,000 bamboo skewers into a back-lit acoustical ceiling. LTL Architects arranged the skewers so that they would achieve a topographical effect, like islands of sea grass.